Offa was King of Mercia who reigned between 757 and 796 AD until his death. Offa was a descendant of PENDA’S younger brother. Following the death of king ETHELBALD, Mercia was plunged into a period of civil war as rival claimants to the throne fought for the prize. Offa succeeded in defeating all contestants and thus emerged as a new strong King of Mercia. The early years of Offa’s reign saw a great period of unrest. Offa had a vision and an ambition to match. He sought to expand his empire throughout southern England south of the Humber. In 771 AD, Offa invaded Kent, which began a period of conflict that would last for 10 years. The Kent Rebellions extended throughout the 775 to 785 period, in which the independence of Kent was reestablished. Nonetheless, Offa eventually succeeded in conquering Kent and this once pround state ultimately became a province of Mercia. In 776, Offa succeeded in defeating the invasion of the Welsh, who sought to recover their border-land. In 777, he defeated Cynewulf, King of Wessex. In 779, Offa took the Welsh March-land, and began the construction of the great dike between his own kingdom and that of Wales, which streched from the Dee to the Wye. This 120-milelong defensive wall protected Mercia from Welsh attacks and it ultimately became known as Offa’s Dyke. Through means of conquest and marriage, Offa managed to reduce Wessex and East Anglia. In 792, Offa murdered King of the East Angles, Aethelberht, thus taking possession of his kingdom. It was due to his vast conquests that Offa was able to reorganize his new kngdom. It was his efforts to expand his own empire that would ultimately lead to the unification of England itself. Offa is also most noted for the issue the first major royal coinage to appear in England since the collapse of Rome. This new coinage proudly displayed his own portrait and in Roman tradition, he also issue coinage with the portrait of his wife – Cynethryth. Offa was also the first post-Roman ruler in England to reintroduce gold coinage – although this was an extremely rare issue. Offa’s ambitions to carve out a unifed kingdom is also demonstrated by his monetary reforms. King Pepin in France introduced a broad silver denier with a weight of 20 grains (1.3 grams). This monetary reform in France was continued by his son Charlemagne. While the exact year of Offa’s monetary reform is not known, it is clear that this continental influence was the model for his abandonment of the old Anglo-Saxson sceat and the introduction of the silver penny throughout England. Two unique gold coins of Offa are also known. While one bares his own portrait, the other is a copy of an Arabic gold dinar. Clearly, Offa’s ambitions were one of molding a fragmented England into a new nation. Offa’ efforts in England paid off. He was also the first king of Mercia to be recognized as a significant power in Europe, and in 789 AD Charlemagne asked for one of his daughters as a wife for his son – a sign of power and prestiege. When Offa dies in 796 AD, he was at the peak of his power. Offa was succeeded by his son, EGFRITH, whom he had consecrated as king before his death. While it had been his dream to establish a new dynasty in England, in this he failed. Egfrith outlived his father by only a few months. The true successor was Coenwulf who ruled Mercia until 821 AD. NOTE: Offa was the first of the post-Roman rulers in Britain to issue gold. Two unique coins are known one with his portrait facing right. The other unique gold coin known is a copy of an Arabic gold dinar. This demonstrates that foreign gold coins did manage to circulate by trade as far north as England. 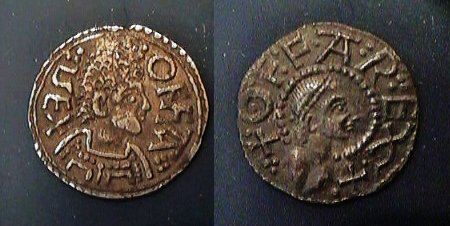 We also find that Offa was the first king in England to also strike a silver penny with the portrait of his wife Cynethryth with is also quite rare.